I have to admit that as much as I've talked about adding music and sound effects to my game I haven't done it very much at all. I still keep collecting sounds, music, and programs to get the job done. The bad part is that at this rate I'll never use the stuff I'm finding, but the good part is that I haven't locked into a particular way of getting these audio files integrated. In my search I came across the Skyland Games blog and their suggestion to use Spotify to add music to your game. There are several music streaming services to choose from and I'm sure there are advantages & disadvantages to just about every combination of free or paid music streaming services. If you have an extra computer, tablet, or smartphone and the appropriate speaker you should be able to use Spotify to "music up" your game. If you are looking to actually purchase music for your use, then at the very least this listing could be used to get a head-start on useful songs/artists to acquire. 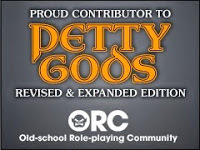 Just FYI: If you lose the link to the list a little too easily in this post, just click on the graphic. 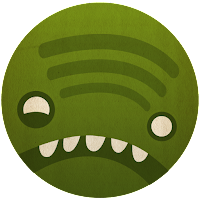 It is a monsterized Spotify icon by Nadja Hallfahrt (and used under license).